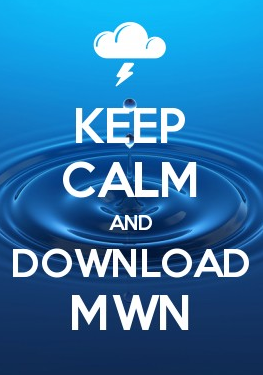 Greetings to all and Happy New Year from MWN! First a word of thanks to all who supported us with your visits, questions and comments, app downloads, and calendar purchases in 2016! We had a great year and look forward to more of the same in 2017! Speaking of more of the same... we've been on a roller coaster of ups and downs in the weather the past few weeks and the trend continues into the first week of the new year, beginning with a warm and stormy Monday, then another blast of Arctic air by mid/late week. Today's blog focuses on Monday and ends with a few comments on the cold that is coming. A seasonal, but moisture-laden airmass is in place across the Mid-South today as a warm front sits across the central Gulf Coast states, well to our south. Meanwhile, well to the west, low pressure is moving into west TX and will shift across TX overnight to near Dallas by Monday morning, then zip east-northeast to a position very near Memphis by 6pm Monday. 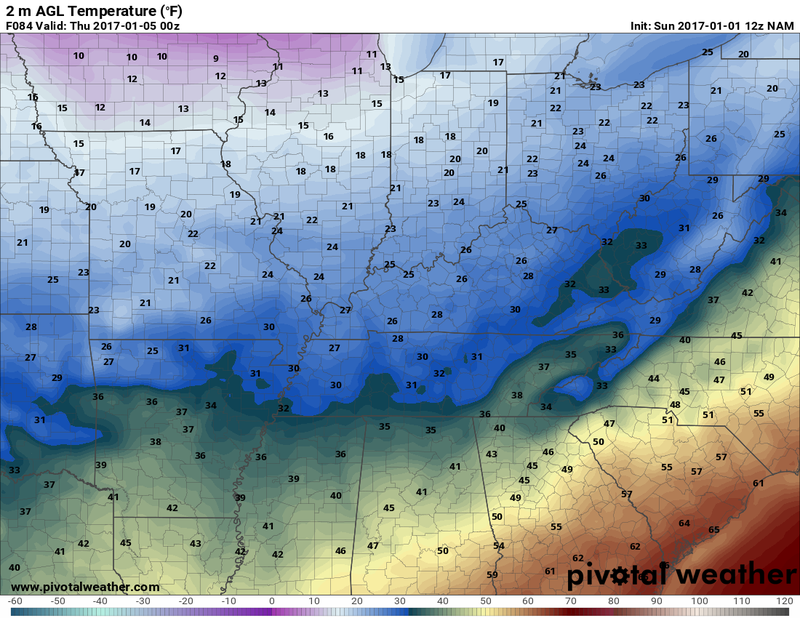 As the low moves toward the Mid-South, it will pull that warm front that is south of us northward, extending east from the low. Scattered showers will be possible by early Monday morning with additional showers popping up as the warm front moves north and wind in the lower levels increases. By lunchtime to early afternoon, lift from the approaching warm front and low pressure system will result in showers becoming scattered thunderstorms. The threat of thunderstorms will continue until early evening when the low passes by to our east. As far as severe weather is concerned, there is a risk of some storms being strong to potentially severe in the metro. 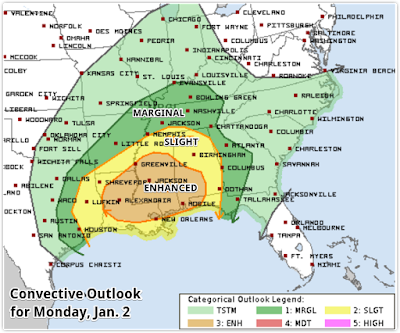 The current Storm Prediction Center outlook for Monday indicates a Slight Risk (category 2 of 5) of severe weather roughly south of I-40 and a Marginal (category 1 of 5) north of the interstate. This outlook will be updated again multiple times tomorrow and could change slightly. The highest risk (Enhanced, category 3) is currently well south of the Memphis metro. There is still some uncertainty in the exact risk level due to forecast models not completely agreeing on the track of the low pressure referenced above. If it passes north of Memphis (such as suggested by the highest-resolution experimental NAM3 model), the warm front also makes it to our north and our severe weather chances increase. If it goes by a bit further to our south (as the GFS model believes it will do), severe weather chances will be lower. I am currently taking the middle road, which is most like the European model, but also supported by the high-resolution operational NAM4 model. 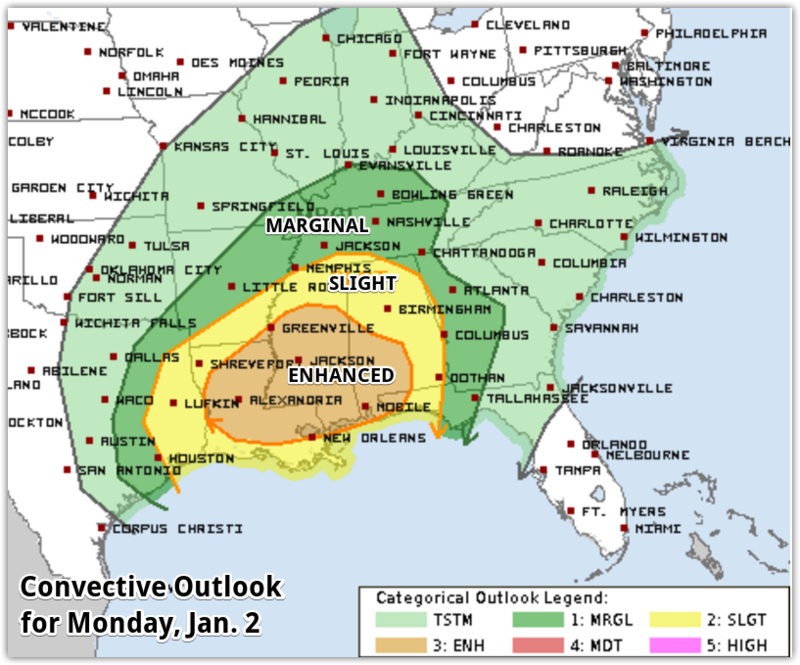 In this scenario, we'll see a threat of severe storms in the metro during the mid to late afternoon hours, particularly over north MS, with a higher chance to our south. The main threats with any severe storm will be damaging straight-line wind of more than 60 mph. We could also see some hail and an isolated tornado is not out of the question, but is a low risk. In addition, fueled by dewpoints rising to near 60 degrees, storms will be capable of producing very heavy rain (over 1"/hour rates) that could lead to minor flash flooding, especially if they move over the same areas repeatedly. 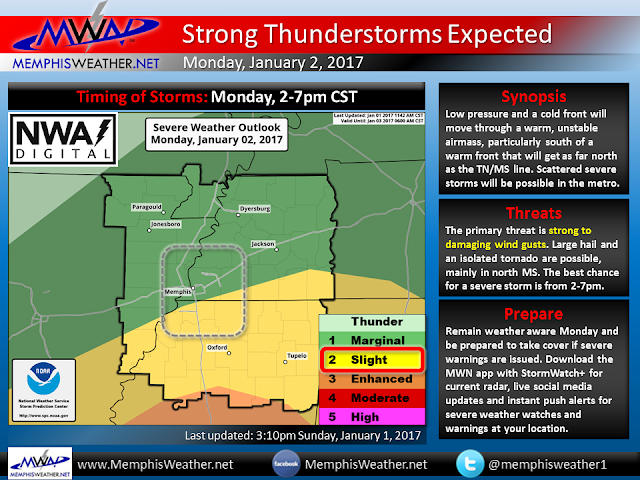 The graphic below summarizes the timing and threats as of late Sunday afternoon. 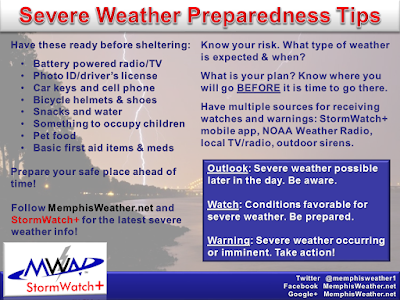 Review the safety tips below in case severe weather occurs. 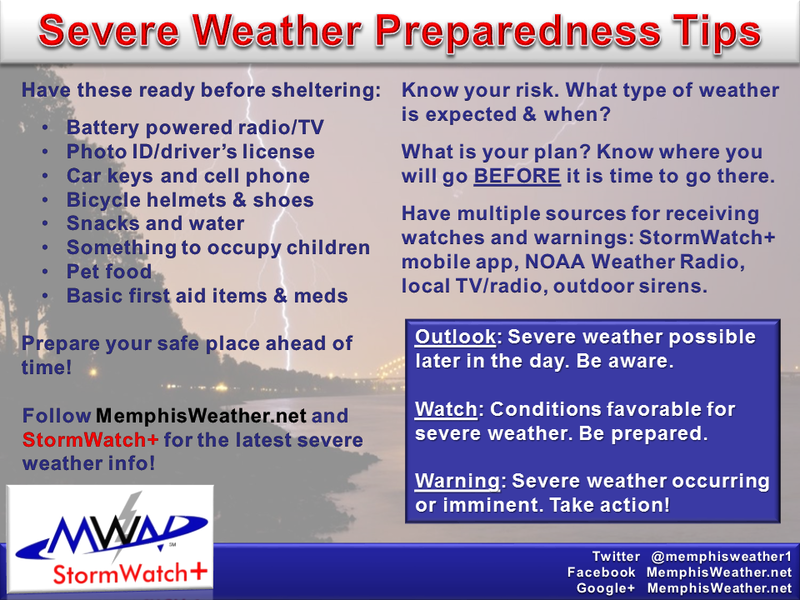 As always, we highly recommend you put the MemphisWeather.net app on your smartphone and add StormWatch+ to the app to receive alerts for any severe weather watches or warnings as soon as they are issued. Links are provided below for more information or to download the app. Looking ahead, Tuesday will be the last "pre-Arctic front" day this week as temperatures rebound into the lower 60s with just slight rain chances. By Tuesday night, that front moves through, switches wind to the north and causes temperatures to fall. The core of the cold air likely doesn't arrive until Thursday or Friday as the Arctic high builds in, but we'll be seeing temperatures that are in the 20s and 30s both days. The previously-discussed southern stream system that had some winter weather potential is not completely ruled out, but chances of light snow are only about 20% as the coldest air moves overhead. Unfortunately, with the high building in, it will likely mean the best moisture also stays to our south, minimizing the threat of any accumulating snow. You can stay updated with the longer-range forecast via the app or at the links below to MWN and MWN Mobile.